Jane Feldman and Elspeth DiMarzio, Director and Organizer for Nevada Toiyabe Chapter of Sierra Club. National Drive Electric Week in Las Vegas, Nevada - kickoff event at Springs Preserve on Saturday, September 12th from 10 AM to 4 PM. Over 45 vehicles arrived onsite during the event, including about 20 Nissan LEAF owners and their vehicles. 140 people visited during the day. Three ChargePoint SAE J1772 AC Level 2 stations provided electricity sourced from the sun by overhead photovoltaic solar panels. The panels are mounted on rotating beams that track the sun as it moves through the sky above. The second annual Electric Juice Bar Crawl took riders on a tour of other local EV recharging sites. NV Energy, The Springs Preserve and the Nevada Electric Vehicle Accelerator (NEVA) program will be promoting the observance of National Drive Electric Week at Las Vegas during that week, in cooperation with local electric vehicle supporters in the region. 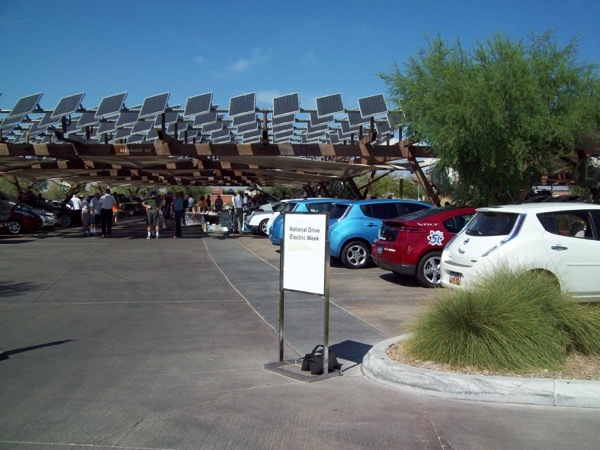 These include Las Vegas Tesla Owners, the Las Vegas Electric Vehicle Association, the SolarNV chapter of the American Solar Energy Society, the Toiyabe Chapter of the Sierra Club, GoSpace, The Hybrid Shop and more. The Las Vegas event will be staged at the Springs Preserve on Saturday, September 12th from 10 AM to 4 PM. The event will include the 2nd Annual "Juice Bar Crawl", that will feature a caravan of plug-in electric cars and passengers. Drivers and riders will tour local recharging stations and other electric vehicle support facilities. The Juice Bar Crawl will start at Springs Preserve parking lot, where there are four AC Level 2 EV Charging ports that are powered during the daytime by photovoltaic solar cell arrays that automatically track and align with the movement of the sun. The Crawl will end at the NV Energy Pearson campus near Jones and Sahara Blvd, where 10 EV charging ports also draw power from a south-facing photovoltaic solar-cell canopy. The sun shines brightly about 300 days each year in the high Mojave Desert that surrounds the Las Vegas Valley, providing many homeowners with enough electricity for both their homes and their electric-powered vehicles. Registered attendees report 372,603 electric miles driven.